Brinks Home Security System has changed their prices slightly. Home security systems have revolutionized the security industry. Thanks to advancements in technology, homes in America are safer than they ever have been. Alarm systems have morphed over the years from just catching those ‘bad guys,’ or warning about a fire, to management and decision making. The cameras and monitoring systems installed by companies like Wayne Alarm are appearing all over the country. Not only do they protect the properties of their clients, but they also have become the witnesses to other crimes by catching perpetrators who may be passing by. One of the top reasons homeowner are installing home security systems is to protect their home and family against intruders. Homes that do not have security systems are at higher risk of being targeted by burglars. By installing a security system, though, it can help provide you and your family with enough warning time to move to a safe location outside the home while authorities are being contacted. Luckily, there are options for protecting you and your family against break-ins. Brinks has many options in security systems and packages to choose from. Depending on your needs, there are many options to choose from when purchasing a home security system. It is best to figure out what type of protection you will need prior to buying a security system. The equipment you will receive when choosing the basic package includes three door and window sensors, a wireless control panel, one wireless motion detector, and yard signs. The basic wireless package costs $48.99 a month and makes for a great option if you do not have a landline in your home. You get all the features in this package as you do in the basic but it is powered through your cell phone service (CellGuard technology), resulting in a less faulty security system in case of bad weather. Along with CellGuard, you get a key fob. 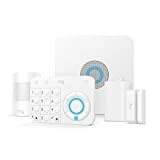 Taking home security to the next level, the plus package has all the features as the basic wireless package along with the ability to let you control your security system and locks remotely from anywhere. This option ranges from $52.99 to $58.99 a month depending on if you opt for their video option. Having a home security system in your home can help keep your home and belongings safe no matter if you are home or on the go. If you have made the choice to invest in a home security system, it is paramount that you shop around and check out your different options. You will quickly notice that you have more than a few options to choose from, and thanks to such a wide availability of security systems for homes, this has helped drive costs down, which is passed on to you. If you think protecting your home is going to be expensive, you will find it comforting to know that security systems are now more affordable than ever. If you would like to learn more about monitored home security systems, please contact Protect America today.